Severe self-serving sins projected on citizenry seeking missing refugees who sought only solace, by soliciting to slip away from State sponsored slaughter – sharply switched into shipped scared skirmishing siblings screaming for snuggles – separated by ICE shielded sentinels strayed from sanity – stranding suckling squirts supplicating for succor, succumbing to superficial slumber in strangling State system. Suspended by salacious supporters of segregation, seeing no Samaritan’s Socialism in sight, souls settle for a smidgeon of scraps, while succeeding selfishness spews from shameless speakers successful at solicitating the unschooled to serve society’s scoundrels in scheme to shift from serene speech, to scatological simplicity of supererogation. Sadly, sucker-punching sublime story-telling seers, is striking out on scoring scoop: middle finger salutes signal strings to spurious schooling, not superiority. 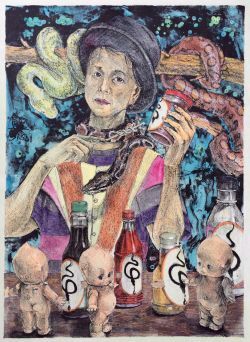 Still sustaining shallow scandalous sessions, with Sessions stoking and stroking shared sanctuary of sweeping squires with sinister secrets – Eden’s serpent savors survival, slandering supreme settled law. Scurrying for support, surrogate’s set-up stories, sacrifice sanity’s savvy on a scorned specious speedway surfaced by sneaks stealing solutions for our studiously salvaging solidarity from synthesis of silly stand-ins. Spotting our susceptibility to self-centered simpletons – hacking serpents and political snakes – swiftly shake off sharing super lies swindling seniors and swinging sincere sophomores into suicidal strife. Straightaway, sternly sling suspicious scrutinizing of society this season and sympathetically seize non-voters with the sufficiency to show up, to speak-out against slippery slope of separateness, for sharpened sticks are not soldiers-at-arms but savage stucco stupor – salient sauce for sham shepherds. August 11-12, 2017 America’s new domestic tribalism proved itself as dangerous as any international terrorism fueled by our war mongering ultra-moneyed. Any corrupted administration easily colludes with power – so, have asylum seeking parents forever lost families because Trump’s America is trafficking brown refugee children? Power is not made in the image of a president for whom a quick read of Proverbs’ sixth chapter, would expose as the very nemesis of all things divine. America’s super power resides in our connectivity with and emulation of all-inclusive community. Many “S” words spell Donald Trump, but his debacle will slither to silence for both supporters and detractors if we don’t sink into the savage peace. Then, like Eleanor Roosevelt, Lincoln, Kennedy, Dr. Martin Luther King Jr, Women’s Marches and Rachel Maddow – we will enlighten current and future Supreme Court Justices, Congressional members and presidents, by ballots cast – of our joint obligation to preserve, protect and defend the United States of America with Justice for All. Now, heal our nation’s self-inflicted wounds.